Moving out into space requires more than ships. There must be stops along the way to resupply and take refuge when needed. Waystations were built as humans moved further out into space. Just getting to one can be a trip. Holding on to one can be dangerous. Making them successful can be almost impossible. In 2054, Earth united under one government. By 2160, Man had colonized the Solar System. In 2180, FTL drive had been discovered, allowing Humanity to move into extra-solar space. For the next two hundred years, the Terran Coalition moved ever outward, placing colony after colony on planet after planet. In 2380, everything changed. 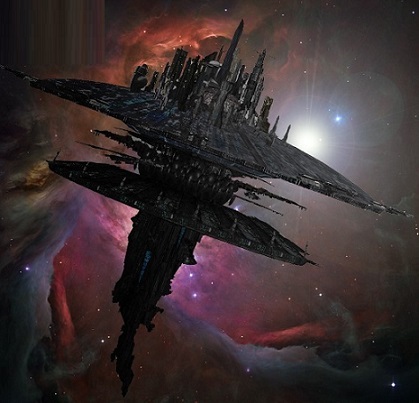 An alien fleet attacked and destroyed The Eden Colony in the A Velorum System, giving no warning. For the next eight years, the Human Race found itself in a fight for survival as it faced the Alien Invasion. Battle after battle was fought, without either side gaining the supreme advantage. The planets of the Kryterium System, so newly opened to colonization, were devastated. Resources stretched thin by the war, the TC had no choice but to abandon it. In 2390, the Alien Invasion ended as suddenly as it had begun. All alien attacks ceased with no explanation, with no attempt to communicate. The A Velorum System, considered to be the cause of the hostilities, was declared off-limits to renewed colonization efforts. Across Human-occupied space, the work of rebuilding began. Part of those efforts included the waystations. Part hostelry, part convenience supplier, part refueling outpost created to break the monotony of long space journeys, they were as much a marker of Man's progress across the stars as the myriad colonies themselves. Foremost of these is the Greybourne Waystations franchise, owned by Gareth Greybourne, which he is looking to expand. As the year 2400 dawns, it is a time of new opportunity and challenge. A time to explore new possibilities. A time of discovering new enemies.